Daya was born and has always lived in Dasna, Ghaziabad, Uttar Pradesh. She lived with other kinnars in a shared bungalow. "Why are people with me? Because other politicians fill their homes and cupboards. And I have no children, husband, wife or heirs. Whatever family I have is these people and I live off these people and I will fight for these people with the politicians who have not delivered on their promises." However in 2014 the District Magistrate cancelled her nomination. On the morning of 4 July 2015, Daya Rani was found dead in her room. She had been shot through a hole cut in the wire mesh over her window, and the gun fired as a train passed so as not to be heard. Two days later the police arrested Waris and one other at the Ghaziabad bus stand, and found a country-made pistol and a knife. The accused had the idea that by murdering Rani, they could obtain her wealth, said to be 1,00,00,000 rupees or more. In addition, Waris, was married to Rani's niece, Geeta, against Rani's wishes. Later Rani had provided accommodation for Geeta and her child, but not for Waris. "A very different glass ceiling to break". The National, March 9, 2009. www.thenational.ae/news/world/south-asia/a-very-different-glass-ceiling-to-break. "Transsexual runs for Indian presidency". Russia Today, 16 Apr, 2009. www.rt.com/news/transsexual-runs-for-indian-presidency. Purusharth Aradhak. "Kinnar set to take on 'outsiders' Singh, Ilmi". The Times of India, Mar 24, 2014. http://timesofindia.indiatimes.com/news/Kinnar-set-to-take-on-outsiders-Singh-Ilmi/articleshow/32568773.cms. "Photos :: Daya Rani files nomination". Prokeraia, Mar 24 2014. www.prokerala.com/news/photos/independent-candidate-for-upcoming-2014-general-169484.html. "Daya Rani Kinnar's murder case cracked, two held". Zeenews, July 6, 2015. http://zeenews.india.com/news/uttar-pradesh/daya-rani-kinnars-murder-case-cracked-two-held_1625794.html. Darren Wee. "India transgender politician who ran for president shot dead: Two men have confessed to her murder". 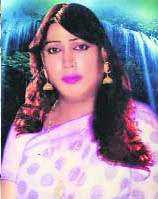 Gay Star News, 30 July 2015. www.gaystarnews.com/article/india-transgender-politician-who-ran-for-president-shot-dead. Most of the news articles refer to Daya Rani as "Daya Rani Kinnar". However 'kinnar' is a local word for 'hijra'. Thus it is like referring to "Sylvia Rivera Transgender". Not a good practice. Not at all!